Topped with a fried egg, this autumn-inspired hash can be served for a weekend breakfast or brunch with family and friends. Heat oil in large skillet set over medium heat; cook sausages for 3 to 5 minutes or until starting to brown. Stir in squash, sweet potatoes, onion, celery, apple, red pepper, thyme, garlic and chili powder. Cook for 8 to 10 minutes or until vegetables start to soften. Stir together 2/3 cup water, vegetable base, ketchup and vinegar; stir into skillet. Cover and cook for 5 to 8 minutes or until squash and sweet potatoes are tender. Sprinkle with cheese and parsley. Divide hash among 6 plates. Top each serving with fried egg. Melt 2 tbsp butter in nonstick skillet set over medium heat; break eggs into skillet. Cover and cook for 2 to 3 minutes or until eggs whites are just set for sunny-side up or cook until done as desired. 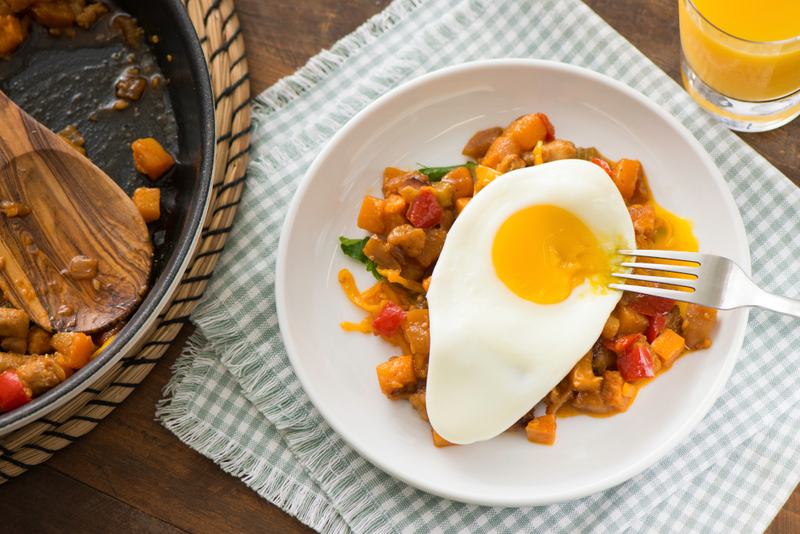 To spice up hash, serve with The Original “Louisiana” Brand Hot Sauce.